In this bold and provocative work, French philosopher Alain Badiou proposes a startling reinterpretation of St. Paul. 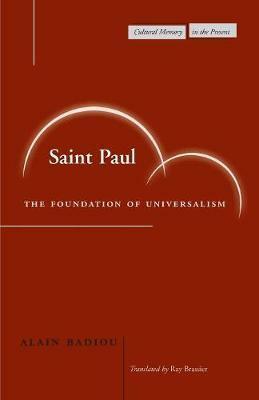 For Badiou, Paul is neither the venerable saint embalmed by Christian tradition, nor the venomous priest execrated by philosophers like Nietzsche: he is instead a profoundly original and still revolutionary thinker whose invention of Christianity weaves truth and subjectivity together in a way that continues to be relevant for us today. In this work, Badiou argues that Paul delineates a new figure of the subject: the bearer of a universal truth that simultaneously shatters the strictures of Judaic Law and the conventions of the Greek Logos. Badiou shows that the Pauline figure of the subject still harbors a genuinely revolutionary potential today: the subject is that which refuses to submit to the order of the world as we know it and struggles for a new one instead. Alain Badiou holds the Chair of Philosophy at the Ecole Normale Superieure in Paris. Several of his books have been translated into English, including Manifesto for Philosophy (1999), Deleuze: The Clamor of Being (2000) and Ethics: an Essay on the Understanding of Evil (2001).